The author goes into great detail not only about "lavender" but its various varieties, the best plants for your region, how and when to plant, which plants grow best together, etc. I really love the time "Virginia" takes with you as she is unhurried in her manner of writing and telling the story of lavender. 5.0 out of 5 starsSo Informative! I have a four year old Lavender Farm in Alexandria Ohio. Our Lavender is used to makes various products to sell at local markets. I am now being asked to speak to groups about the Lavender business. I am also a Master Gardener for Licking County Ohio. We are taught to educate others as much as possible using well researched materials. In order to learn the business, I had to educate myself and now that I am speaking about the subject, I wanted to have samples of my favorite books on hand to recommend to others. This was one of the books. 2.0 out of 5 starsBoring like an encyclopedia. No advice, no words of wisdom, just pages and pages of botany facts for different species of lavender.i thought I was going to be guided through growing it.... Nope. This gardening book easily explains all things lavender! I honestly believe this book to contain a clear color photograph of every type of lavender imaginable! It includes all lavenders and subspecies, including English, French, Spanish, and lavandin. If you like lavender, this is the book for you. I also refer to this book as "The Lavender Bible." It covers lavender cultivation and grower tips, lavender identification (incase you don't know what type of lavender you have), fabulous resources, and worldwide lavender clubs and organizations. This book is incredible! 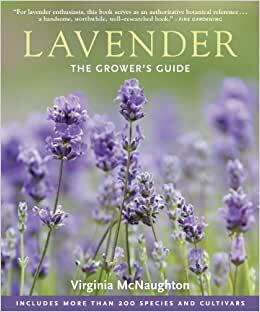 Understand, this book does not include any type of craft projects involving lavender, it is a GARDENING book and it is absolutely the best one I've ever found on lavender.